Red Dog Review. 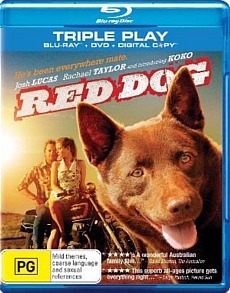 Red Dog is a great little Aussie tale, full of colourful characters and memorable scenarios. Australians love telling stories, there’s no doubt about it. Whether it be the Aboriginal tales of dreamtime, passed down through songs and artwork, or the exaggerated tales told around every barbeque, water-cooler and bar in the nation, yarn-spinning is one of our favourite past-times. That’s what Red Dog is, a yarn. Most of the story is related by key characters as they lean on a bar or smile and stare past the camera, as if gazing into the past. At the beginning of the narrative, publican Jack (Noah Taylor) tells how he and wife come across the titular pooch, sitting and waiting in the middle of an outback road. They give the dog a lift into the mining town of Dampier, and he quickly becomes a mascot for the local workforce. Owned by no-one, loved by all, he comes and goes where he pleases. The dynamic changes when Red Dog latches onto American bus driver John (Josh Lucas). John is reluctant at first, but a mutual bond slowly forms until the pair are true friends. But then John catches the eye of local girl Nancy (Rachael Taylor) and the friendship starts to show signs of strain. The pace of the story ebbs and flows, often detouring into surprising and quirky sub-plots. It’s not just one narrative but several, woven together through the viewpoints of different characters. There is an episode involving a stolen bit of steak and a giant shark, and a hilarious Mexican stand-off with a very nasty looking cat. The dialogue is more fanciful than realistic, with a surreal ‘storybook’ kind of feel to it. Even if the characters tend to ramble in their monologues, they are beautifully eloquent. Some of the more emotional sections rival a presidential election speech in the way that they make the hairs on the back of your neck stand on end. The canine actors (more than one doggy was used to play the role) have been utilised very well, but on some occasions you get the feeling that they were being asked to express too much. Sometimes the actors respond to the dog’s facial expressions or actions in a way that doesn’t seem believable. Thankfully these moments are very few and far between. The cinematography is beautiful, and makes excellent use of the stunning scenery on offer. There are some truly memorable shots, such as a lonely Red Dog trotting down a deserted pier, surrounded by silent machinery. The sun, as a natural light source, is used exceptionally well, drenching the frame in warm colours. Included on the DVD is the mandatory audio commentary, as well as a handful of deleted scenes, storyboards and trailers. The most interesting special feature takes you through the training of the various animals used in the movie, who are of course the real stars. Red Dog is a great little Aussie tale, full of colourful characters and memorable scenarios. Oh and one more thing: This movie can be a real tear-jerker. It’s the first time I’ve seen my girlfriend cry while watching a DVD. Don’t say I didn’t warn you!